Several first-time-physical locations, a new Lidl and Walmart’s Innovation Store in Lake Nona. The number of legitimate retail corridors in NYC has ballooned. It used to be that you needed a 5th Avenue store to kick off your US expansion, now there are several areas that can work, but we saw a large concentration of new concepts, first US location or first-time-physical locations clustered in SoHo/Nolita. First-time physical locations are acting as much as brand ambassador as a source for sales. Associates are passionate about telling their company’s story and making sure your visit to their brick and mortar location reflects the aspirational features of their brand. Stickers and pins are everywhere, like real life emojis. Adidas Flagship – opened in December, three levels with a track and training area plus a whole floor for “originals” capitalizing on the popularity of Stan Smith shoes and other classics. H&M has their home collection in just a few locations. Interesting, on-trend selection at low price points, very much in line with what we expect from H&M. Brookfield Place has clustered new concepts in a second floor space that’s a bit odd to find and in between the main retail section and some office lobbies, but once you find it you see Peloton’s micro shop (the only micro in the fleet), a kiosk-style Warby Parker, plus Suit Supply, Cos Bar, Starbucks Reserve and DryBar. Thanks to Santiago Calatrava, the Oculus does a nice job of elevating the transit hub to architectural significance like a modern day 30th Street Station in Philadelphia. The retail is mostly a mix of the usual suspects. STORY: http://thisisstory.com/ The brainchild of Rachel Schectman, STORY is a retail space that acts like a magazine, showcasing a different “story” every 4-6 weeks in partnership with corporate sponsorships ($500k a pop). Today’s story is Fresh Story sponsored by Jet.com and features retail items focused on fresh as well as a refrigerated case where you can sample Jet.com’s produce. Recurring stories include their Home for the Holidays Story, where the store is set up like a home with gifts for particular rooms, and Love Story around Valentine’s Day. Peloton Studio: I finally made it to the studio where they film/stream their spin classes to be utilized on in-home bikes. Jenn Jacobs was a great instructor and is treated like a rock star after class (I’ll spare you the sweaty selfie with her). Peloton is a great marriage of physical and tech, taking a page from Tesla and Apple. But others are coming to take a bite at the apple. This Fall, Flywheel will start selling their bike for in-home use. Though they have more than a dozen locations in high street and mall locations to showcase the bike, all content is created at the Chelsea Studio. Away is one of several in the “smart luggage” category (see also Raden) featuring hard-sided lightweight cases with internal usb-charging batteries and other perks at mass-market pricing. I’ve been using my Away bags for several months now and haven’t had great results (lots of scratches and two of the three cases needed repair already), but hope they can work through their manufacturing challenges. The store has both their product and those of complementary startups. They’re showcasing a Minions capsule collection (their last capsule collection was with J. Crew) along with leather stickers which can be used to customize the bags. This is their only physical location. Everlane is a digitally native company that focuses on men’s and women’s higher end basics with a transparent pricing model showing cost and markup. This location is their first “permanent popup” and is on the 5th floor of a building on West Broadway. That didn’t stop a steady stream of people coming in and out. They estimate half the visitors are loyalists that seek out the store and half wander in. This store is a guide shop hybrid where about half the items are shipped to you (most of the clothing) and the other half are carry-out (bags, shoes and accessories). This is M Gemi’s first physical location. They focus on Italian made luxury shoes at direct-to-consumer prices. The store is designed to encourage lingering and features living-room style furniture plus a bar stocking illy espresso and Campari. They’re a true showroom with one of each color and size but not every color and size. Orders are shipped to home. There are a cluster of cold-weather lifestyle outfitters all within two blocks of Wooster in SoHo: Canada Goose, Woolrich and Moncler. Canada Goose’s store was fairly standard in content and layout. Coats were generally categorized by their rating system of 1 to 5 with 5 being Arctic-level protection. They’re branching into more fashion-forward lightweight pieces and on-trend patterns like camo. I was the only person in the store, but to be fair, it was 97 degrees outside, not generally when you want to be trying on a coat. I’ve been impressed with CG’s website where they have detailed sizing recommendations based on a few questions about your height, weight and body-type. They give recommendations on your size for each coat based on actual customer return patterns, helping to reduce the need to buy two sizes or return for poor fit. Woolrich had everything you would expect, coats, blankets and accessories. Nothing particularly outstanding. Like Canada Goose and Moncler, this is another example of a legacy brand’s foray out of wholesale and into a stand-alone location. Moncler – if you thought $900 for a Canada Goose coat was crazy, then don’t go to Moncler. This ultra luxury cold weather outfitter touts its sustainable practices surrounding their harvesting of down and feathers. Sounds like those geese have a great life right up till the point they’re killed for their feathers. Repetto is the first US store of this French brand that has over 100 stores throughout Europe. They’re known for ballet-style shoes and clothing at a luxury price point. They have a station in the back where you can design custom ballet shoes with webbing, leather and laces in dozens of color options, then they’re hand made in France in 6-8 weeks for a only $550. Repetto’s French/ballet theme is complemented by the two adjacent shops which also cater to French culture including one of two US locations for macaron bakery La Duree. The Bloomingdales in SoHo houses a shop-in-shop drybar which is the only shop-in-shop in the drybar fleet. Bogner – this is the first and only retail location for this decades-old wholesale lifestyle brand. PIRCH: already well known as the pinnacle of a delightful customer experience, this luxury kitchen and bath fixture store let’s you fully utilize everything they sell, down to taking a shower with a dozen different shower heads. UPTON: direct to consumer high end leather goods focused on unisex belts, wallets and other accessories. Monsur Gavriel: also direct to consumer high end leather goods, but mostly purses and shoes. An established wholesale brand with sales at high end stores like Liberty London. Sleepy Jones: because everyone needs $300 pajamas, which counts Andy Spade (of Kate Spade retail fame) as one of its founders. Opening Ceremony, which has expanded over the last 15 years into four floors, including their own brand plus also a mix of emerging and established brands throughout the price spectrum. This store is set up with both permanent collections (brands you may find at Barney’s) as well as a rotation of specialty collections. Today they were showcasing vintage rock clothing and accessories. There was a mix from a $30 Opening Ceremony branded tote to a $400 t-shirt. The Glossier store was the one I most wanted to see but didn’t get to visit. 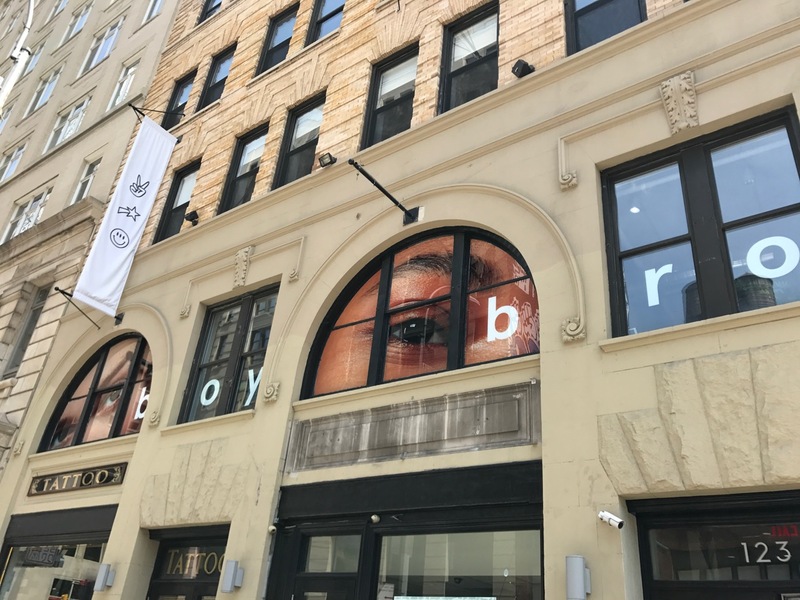 Upstairs in a building in Nolita, the sign doesn’t even say their name, but instead highlights one of their best selling items, the boy brow. Glossier is a digitally native skincare and makeup brand that uses customer data to formulate products that meet customer needs. This location has been open for months and it’s still so busy there’s a 30+ minute line to get in – which I would have waited on if it wasn’t 96 degrees. Last but not least – Poke shops are popping up in New York. Maybe this is the next Acai bowl/burger place/yogurt shop/juice bar? We visited this store a week after opening, arriving just before their closing time to find the store had no power. As an accomodation, the associates were handing out a coupon flier plus a back of chocolate covered acai berries. In the morning we returned to find mostly what was expected. Slightly nicer than an Aldi with more fresh selections and some organic. Bakery was good, not great and there was no fresh deli. The Surprise section was fun to look through but was mostly filled with an odd mix of dorm-like decor and flip flops. Kids loved the little carts. Walmart’s Innovation Store uses both new technology and new offerings. We were greeted by a scan & go kiosk that allowed customers to bypass much of the checkout process by using the scanner while shopping. Also on tap was an expanded beauty section which was paired with a salon. Entertainment looked similar to existing stores but had a more open feel and significantly more associates than a typical Walmart. Grocery offerings were impressive with a layout and depth of products that matches a traditional grocer. Overall, we were very impressed by this store and what may be to come in future Walmart Supercenters. The only confusing part was Grown, their new restaurant partnership. It was nice and bright and had healthy options but the pricepoint was way off – my snack and juice cost $17 which seems out of line for the typical Walmart customer. Grown was empty, but pretty.